A necklift, also known as a lower rhytidectomy or submental lipectomy, is a combination of surgical procedures that are designed to improve the appearance of your neck. Internationally recognized plastic surgeon, Dr. Javad Sajan, has extensive expertise in the demanding process of reshaping this delicate area. Visit Dr. Sajan for some of the best results from a necklift Seattle can lay claim to. What is a Neck Lift? A necklift can alter sagging neck muscles, tighten the skin and underlying tissues of the neck, and remove fatty tissues that have accumulated under the chin. The procedure(s) may be extensive and possibly combined with a face lift, or a "mini neck lift" that is done to specifically address a "turkey wattle" appearance. Many patients seek a neck lift to address early signs of aging and restore a more youthful contour to the face and neck. Is a Neck Lift Right for You? 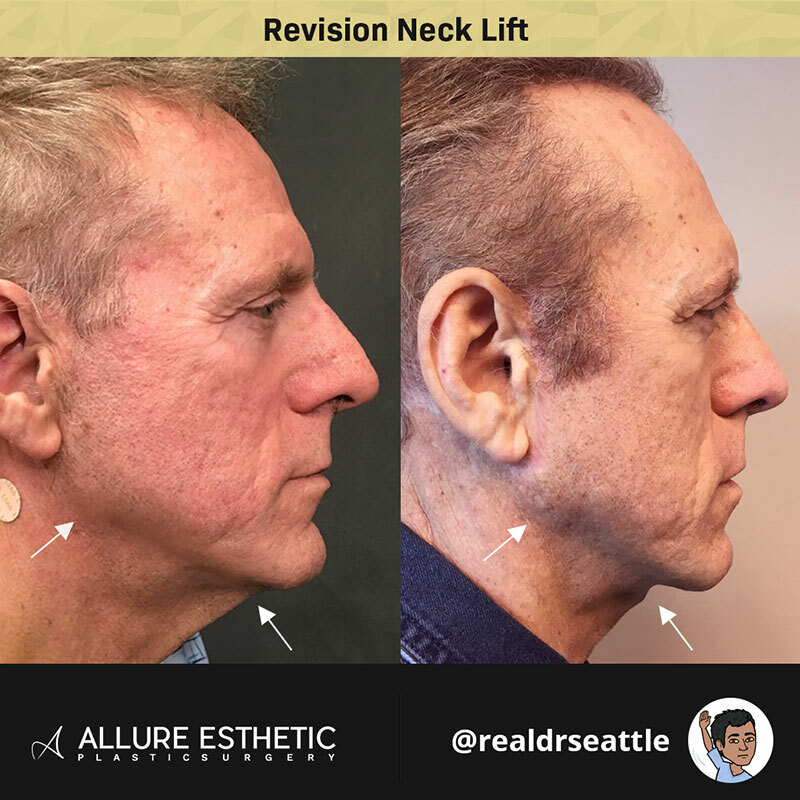 A necklift in Seattle can deliver a transformed, more youthful appearance, but it's not right for every patient. One of the most important factors in determining your candidacy is your skin elasticity. With a neck lift, the skin needs to be able to stretch over your new neck contours. If it's lacking elasticity, or is too taut or too thin, you won't qualify for the procedure. In consultation, you and Dr. Sajan will discuss goals for your Seattle necklift as well as procedure options. He will evaluate the overall condition and appearance of your skin, take measurements of your face, and evaluate your general health level. Dr. Sajan also uses Canfield Mirror software during consultation to create medical imaging (morphing) of before and after pictures. This imaging can help you better envision the likely outcome of your surgical procedures. Choosing to have a neck lift involves not only your well-thought out reasons for seeking plastic surgery, but also some natural anxiety and excitement about the process. You may feel confident discussing any of your concerns and feelings with Dr. Sajan during your consultation. As with all of Dr. Sajan's procedures, your neck lift surgery will be performed in our state-licensed surgery center. Depending on the procedures you're having done, you may be given a general (deep sleep) anesthesia or a local anesthesia and intravenous sedation. You can expect the procedure(s) to last approximately two to three hours, depending on the extent of work to be done. During surgery, incisions will be made at precise points on your face and neck, strategically placed to minimize your risk of scarring. They will be well-hidden within the hairline and facial contours, so your final result is completely discreet. From there, Dr. Sajan may redistribute or suction out fatty deposits, as well as tighten, reposition and remove loose skin. The actual alterations will depend on your needs and skin quality. For example, if your skin is in relatively good condition, you may require only a simple liposuction procedure to achieve your desired results. Conversely, if you'd like a dramatic transformation, Dr. Sajan will tighten and reposition the underlying muscles and remove excess skin. Once your neck lift is complete, Dr. Sajan will perform your complementary procedures, as discussed during your initial consultation. For example, many of our patients decide to combine their neck lift with a facelift, brow lift or eyelid surgery, completely rejuvenating their facial appearance for a younger and more attractive overall look. Regardless of the procedures performed, you can be assured that Dr. Sajan will make sure your incisions are discreetly placed, and the correction looks extremely natural, never artificial or overdone. Once your surgeries are complete, Dr. Sajan will close the incisions with very fine, dissolvable sutures and you will be sent home to begin the recovery process. Immediately after your neck lift, Dr. Sajan will place a pressure bandage around your face and neck to minimize swelling. You'll need to have a friend or family member drive you home after your procedure and stay with you for at least a few days, as moving around the house and performing your normal daily routine will be difficult. In addition, you will need to spend the initial days of your recovery primarily resting in bed. Though you can expect to experience some pain, Dr. Sajan will provide you with medication to manage any discomfort. The recovery time associated with a neck lift is variable. With that said, most of our patients are able to return to work within two weeks. However, you will need to continue to avoid strenuous activity for a few weeks longer, to avoid interrupting the healing process. During your post-operative appointments, Dr. Sajan will provide you with detailed instructions on when you will be able to resume your normal activity levels. The best outcome of a neck lift is when you look naturally refreshed and somewhat slimmer and feel a restored sense of confidence about yourself. Contact Dr. Sajan's Seattle office to schedule a consultation when you are ready to plan your neck lift surgery. Dr. Javad Sajan specializes in Breast Augmentation, Rhinoplasty, Mommy Makeover and Facelift surgery in Seattle. Disclaimer: All surgical and non-surgical results are subject to the individualities of the patient and the normal variability of clinical procedure results. Monday – Friday 8:00 a.m. to 9:00 p.m.
© 2019 Allure Esthetic Plastic Surgery. All Rights Reserved.